The AL East was up late last night. While the Red Sox were on their way to a 19th-inning walk-off over the Blue Jays, the Orioles and Yankees were sitting through a two-plus-hour rain delay, and Baltimore was slowly inching back from a 6-1 run hole. And then, finally, around 1 in the morning, Manny Machado sent everyone home. Down one in the ninth, the O’s looked dead in the water. But as Bob Prince used to say, all you need is a bloop and a blast—in this case, a walk from Tim Beckham, and quite a blast from Machado. Machado, who was serenaded all evening by visiting fans with chants of “Future Yankee,” is on a roll. He was just named AL Player of the Month for August, and it’s his third walk-off home run in the last 19 days—the shortest span since Sammy Sosa did it in 1996. 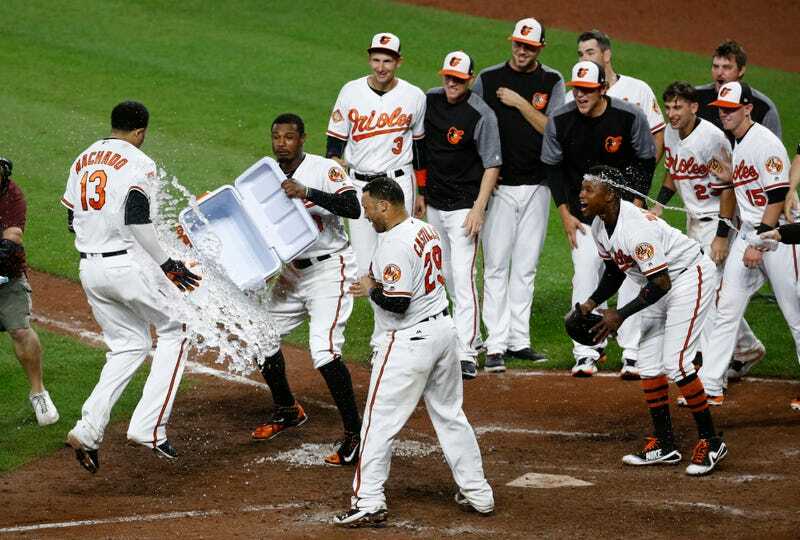 The winner was Machado’s second of the game, as Machado goes neck-and-neck with Jonathan Schoop for the team lead: Machado pulled ahead with his 31st in the third inning, before Schoop matched him two innings later—a tie that would last until the very last pitch of a long, long night. And yet, in the clubhouse after the game, Machado and Schoop were going head-to-head in a game of chess. It was a big, big win for the Orioles: They’re now just one game back of the Angels for the second wild card, in the middle of a pile-up that includes eight teams all within 5.5 games of each other for the two spots. Bryce Harper, What The Hell?? ?